This piece is part of a project where Jason and Caleb analyze the top eight Ducks prospects for the 2015 NFL Draft. The prospects will be listed in the reverse order in which they are projected to be drafted. Enjoy. Overview: I​fo Ekpre­-Olomu made a bold decision in 2013, opting not to enter the NFL Draft and instead return for his senior season. Ekpre­-Olomu was projected to be anywhere from a first to third round pick, something not many guys pass up. He returned because he felt he could do more and, in some regards, he was right. Ekpre-Olomu finished second on the team in pass breakups and interceptions, while recording 63 tackles and a forced fumble. He even was a Jim Thorpe Award Finalist as one of the top defensive backs in the country. To some, though, 2014 was a disappointing campaign for the All­-American. Ekpre­-Olomu saw a statistical decrease in almost every major category, and in a pre­-Rose Bowl practice he suffered a season-ending knee injury, ultimately ending his senior campaign and plummeting his draft stock. 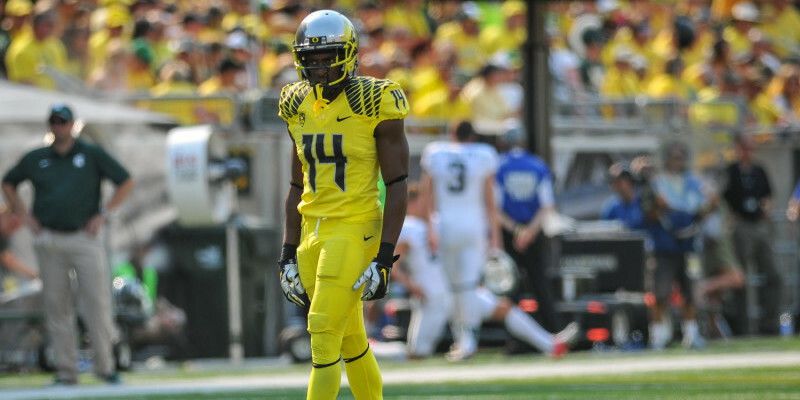 Ifo has the athleticism and football IQ to be one of the best at his position, but his injury is very serious. He’ll have to prove to scouts that it will be a non-factor moving forward, and that he actually is worth the risk. Ekpre-Olomu possesses above average explosiveness and athleticism and, with the ever increasing need for cornerbacks as pro receivers continue to improve, Ekpre­-Olomu could become quite the commodity. Strengths: E​kpre-­Olomu is strong in many facets of his game, but he’s specifically strong when adjusting to a route. He had some of the quickest feet and hips in all of CFB last season and, consequently, opposing receivers struggled mightily against Ekpre-­Olomu. His football IQ is off the charts, and he’s able to recognize routes before receivers even finish running them. He’s also a strong tackler despite his size, at times using amazing aggression to secure tackles. On top of all that, Ekpre-Olomu has some of the best ball skills of any defensive player in the draft. He has a knack for knowing where to be, and he often makes big plays when his team needs him the most. Sometimes his desire to make a big play can catch him out of position but, for the most part, Ekpre-­Olomu is a very well rounded CB. Weaknesses: S​ize is seemingly always an issue with Oregon players, and Ekpre-Olomu is no exception. It’s not as though he’s particularly undersized for his position but, with the average height of an NFL receiver being 6’2″, Ekpre­-Olomu will soon learn just how much those extra five inches matter. Ekpre-­Olomu was taught and implements the trail technique in coverage, using his elite athleticism to make a play on the ball once it’s in the air. That method, although effective in the NFL, will be hard to utilize with his size. Also, Ekpre-­Olomu sometimes tries an unnecessarily difficult angle or even misses tackles because of using improper form. If Ekpre-­Olomu can nail down his consistency, he will be a force to be reckoned with at the next level.